INVEST IN YOUR YOGA PRACTICE: GIVE A TAX-DEDUCTIBLE GIFT TO IYD! Make a donation to YOUR local Iyengar Yoga Center to help us inform the community about the benefits of Iyengar Yoga, and enable us to collaborate with schools and other organizations to bring the transformative power of Iyengar Yoga to them. Hire a part-time administrator who will head the PR and Fundraising Committees, complete paperwork to file as a nonprofit 501(c)3, and perform everyday tasks to keep IYD running. Create a sweeping marketing campaign which includes a website, print media such as postcards, business cards, and a newsletter; and ongoing social media presence. 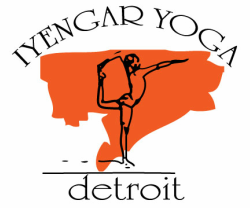 Partner with nonprofit organizations to bring Iyengar Yoga to their communities, such as Alternatives for Girls Shelter, schools, 826 Detroit after-school programs, New Work Field Street Collective. Donations are appreciated. Donate $25, $50, $100, $500 or more. You choose! The support you give will go a long way to help fortify your Iyengar yoga community.